Insider: A. Lange & Söhne Datograph Up/Down Pink Gold. Hands-on with One of the Most Iconic Timepieces From Saxony. For over ten years, the A. Lange & Söhne Datograph Up/Down has been the benchmark in chronographs since its launch. Its assets include the oversized date, the high-speed flyback switching mechanism for the chronograph and a patented, precisely-jumping minute counter. The Datograph Up/Down also features a power reserve indicator. Only available in 18K rose gold or platinum both with a black dial, the new Datograph —as it replaced the 39 mm model— is one of the most iconic Lange timepieces out there. Its elegant look but somewhat sporty at the same time is mesmerizing and captivating. Fitted with one of the most amazing chronograph calibres, the A. Lange & Söhne rises in full glory whenever it gets spotted in the wild. If you want one of the most amazing chronographs out there, look no further. The A. Lange & Söhne Datograph Up/Down ref. 405.031 is fitted with a beautiful solid silver black dial with running seconds at 9, 30-minute chronograph counter at 3, oversized date display at 12 and power reserve indicator at 6 o'clock. Fitted with a sapphire crystal with anti-reflective coating on both sides, the readability of the dial is uncompromised at any angle. The elegant 18K pink gold case measuring 41 mm in diameter by 13.1 mm in thickness, is finished with a satin brushed middle case band and a highly polished bezel. The watch features rectangular pushers for the chrono —that are soft as butter— and a convenient date adjustment rectangular pusher at 10 o'clock. 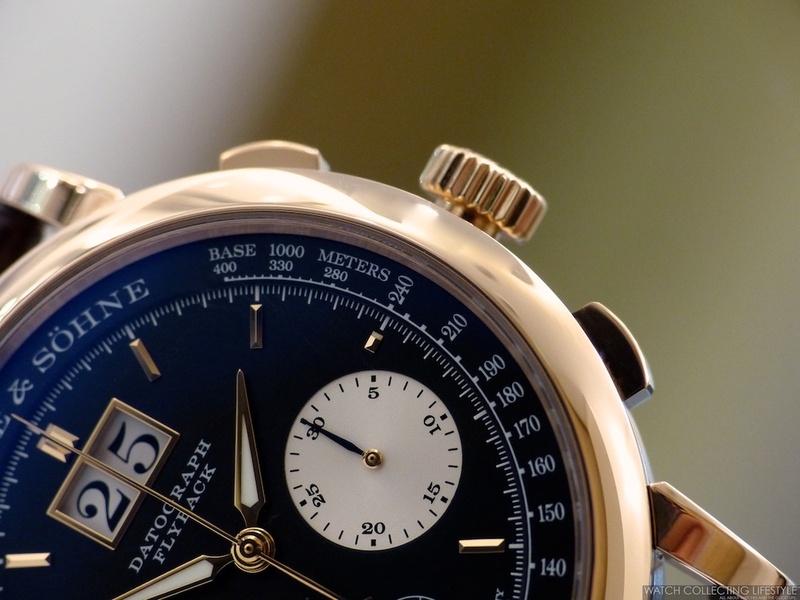 The crown is of course signed A. Lange & Söhne and the pushers feature alternating brushed and polished areas. For a solid gold 18K pink gold watch, its total weight is relatively low when compared to other watches weighing only 125.7 grams of pure Lange goodness. The watch is equipped with a gorgeous brown alligator strap with Lange pin buckle. The strap is somewhat stiff when new and one that will for sure require at least a good week of continuous wear to break it in. Powered by the Lange manufacture calibre L951.6 composed of 451 parts and 46 jewels —4 in gold chatons—, the movement beats at a frequency of 18,000 semi-oscillations per hour. As usual, the calibre is fully visible via the display case back with anti-reflective treated sapphire crystal. All 451 parts of the L951.6 manufacture calibre are lavishly finished. The sharply polished reentrant angle of many calibre components is an indication of the amount of work involved: this delicate, time-consuming process can only be executed by hand. The 8-gap column wheel coordinates all the switching operations of the chronograph mechanism. Rockers and levers of various shapes engage with this wheel. The considerable length of the levers is due to the special dial arrangement. They bypass the outsize-date mechanism and bridge the distance to the subsidiary dials located below the center line. Lange’s proprietary balance with six precisely adjustable poising weights assures superior rate accuracy. It is powered by a balance spring crafted in-house at Lange. Each spring is scrupulously matched to the characteristic of the respective movement to assure optimized rate values at its frequency of 18,000 semi-oscillations per hour. On the wrist, the watch wears very comfortably and perhaps a little larger and more like a 42-43 mm case. Without a doubt the Datograph Up/Down is one of the most iconic chronographs out there and one that sets the bar pretty high for chronographs. Next time you are traveling to Dresden with this watch on your wrist, you'll notice the wandering eyes of other watchlifestylers trying to guess whether you are going to a special function at the A. Lange & Söhne manufacture or not. When you notice their eyes, just pull your sleeve down and have them beg for more, unless you're wearing it with a short sleeve and that, is not an option. Sticker Price $70,200 USD. For more info on A. Lange & Söhne click here. Posted on December 18, 2015 by Editor & Publisher and filed under A Lange Sohne and tagged A. Lange & Söhne Datograph Up/Down A. Lange & Sohne Most Popular.